Charlie the Tuna tried very hard to show Star-Kist that he had good taste. "But Charlie! Star Kist doesn't want tuna with good taste. 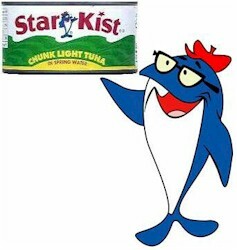 Star Kist wants tuna that tastes good!" Guess dumb ol' Charlie thought only the best got 'caught' but had no clue what happened to them after that! And they used to tell us fish was "brain food."